Chief Newcomer founded Coshocton, moving his people west from their former principal settlement of Gekelmukpechunk (called Newcomerstown after the chief by the few white traders and settlers there.) Most of the latter's Lenape population of 700 followed Newcomer. Coshocton was across the Tuscarawas River from Conchake, the former site of a Wyandot village. 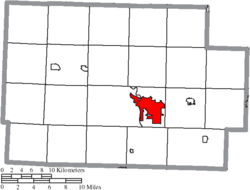 By then the Wyandot had migrated northwest, in part of a movement of numerous tribes. The name Coshocton derives from Lenape Koshaxkink, 'where there is a river crossing,' altered to Koshaxktun 'ferry' (river-crossing device). The western Lenape were split in their alliances during the American Revolutionary War. Those who allied with the British moved further west to the Sandusky River area, closer to the British Fort Detroit. From there the British and Lenape raided colonial frontier settlements. The Lenape sympathetic to the new United States stayed near Coshocton. Chief Newcomer signed the Fort Pitt Treaty of 1778, by which the Lenape hoped to secure their safety during the War, and he promised scouts and support to the rebel colonists. They also hoped to lay the base for a Native American state in the new nation. In retaliation for frontier raids by hostile Lenape and British, Colonel Daniel Brodhead of the American militia ignored the treaty. He attacked and destroyed the Lenape at Coshocton in April 1781. After the Revolutionary War, the Ohio Country was opened to European-American settlement. They were mostly farmers in the early years. Additional development and greater trade accompanied the opening of the Erie Canal in 1824 across New York State. It provided transportation for farm commodities to eastern markets via the Great Lakes, the canal and the Hudson River, to the port of New York. Coshocton was originally called Tuscarawas by American colonists, after the river, and under the latter name was laid out in 1802. 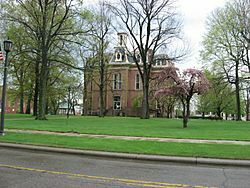 The young town was renamed Coshocton when it was designated county seat by the legislature in 1811. To improve their transportation of goods and people, residents of Ohio supported construction of the Ohio and Erie Canal. This enabled the transport of coal mined in the region, which was its most important resource commodity. In addition, the canal supported transport of goods manufactured by local industries that developed in the 19th century with the availability of coal. In 1886, an idea by a local printer gave rise to the specialty advertising industry, which, from its "birth" in Coshocton, eventually developed into various manufacturing companies all over the country. Today, four specialty advertising companies still thrive in Coshocton. 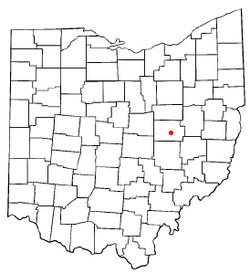 Coshocton is located at (40.267786, −81.856628). As of the census of 2010, there were 11,216 people, 4,872 households, and 2,927 families residing in the city. The population density was 1,388.1 inhabitants per square mile (535.9/km2). There were 5,458 housing units at an average density of 675.5 per square mile (260.8/km2). The racial makeup of the city was 95.7% White, 1.8% African American, 0.2% Native American, 0.4% Asian, 0.3% from other races, and 1.6% from two or more races. Hispanic or Latino of any race were 1.1% of the population. There were 4,872 households of which 27.1% had children under the age of 18 living with them, 42.5% were married couples living together, 13.1% had a female householder with no husband present, 4.5% had a male householder with no wife present, and 39.9% were non-families. 34.9% of all households were made up of individuals and 17.9% had someone living alone who was 65 years of age or older. The average household size was 2.25 and the average family size was 2.85. The median age in the city was 42.9 years. 21.7% of residents were under the age of 18; 7.7% were between the ages of 18 and 24; 23.2% were from 25 to 44; 27% were from 45 to 64; and 20.5% were 65 years of age or older. The gender makeup of the city was 46.8% male and 53.2% female. As of the census of 2000, there were 11,682 people, 5,048 households, and 3,160 families residing in the city. The population density was 1,562.1 people per square mile (603.0/km²). There were 5,471 housing units at an average density of 731.6 per square mile (282.4/km²). The racial makeup of the city was 96.05% White, 1.63% African American, 0.16% Native American, 0.79% Asian, 0.02% Pacific Islander, 0.33% from other races, and 1.03% from two or more races. Hispanic or Latino of any race were 0.59% of the population. There were 5,048 households out of which 28.0% had children under the age of 18 living with them, 48.5% were married couples living together, 10.8% had a female householder with no husband present, and 37.4% were non-families. 33.5% of all households were made up of individuals and 17.7% had someone living alone who was 65 years of age or older. The average household size was 2.27 and the average family size was 2.87. In the city the population was spread out with 23.2% under the age of 18, 7.6% from 18 to 24, 25.5% from 25 to 44, 23.6% from 45 to 64, and 20.1% who were 65 years of age or older. The median age was 41 years. For every 100 females there were 86.1 males. For every 100 females age 18 and over, there were 82.2 males. The median income for a household in the city was $31,098, and the median income for a family was $42,088. Males had a median income of $31,163 versus $22,130 for females. The per capita income for the city was $17,436. About 6.8% of families and 8.3% of the population were below the poverty line, including 7.3% of those under age 18 and 6.4% of those age 65 or over. Coshocton, Ohio Facts for Kids. Kiddle Encyclopedia.